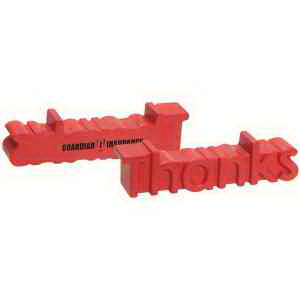 When you can't think of the right words to thank your customers, just hand them this item as a token of appreciation! This Thanks word shaped stress reliever is bound to motivate and inspire recipients. Measuring 5 1/4" x 1 1/4" x 1", this handy giveaway is ideal for sports teams, volunteers, employees, graduation classes, fundraisers and organizations. These unique "word" stress relievers are great for conveying a lasting positive message! I'm interested in learning about the Thanks Word Stress Reliever. Please contact me.